Well-drained, moderately acidic soil amended with compost. Full sun in beds, partial shade in containers. In fall and again in early spring, topdress established plants with rich compost or an organic fertilizer. Allow plants to rest in midsummer. Beans, Lettuce, Spinach, Thyme, Onions and Nigella. Set out plants in early spring, or in fall in mild winter areas. Take care not to bury the central crown when transplanting. Can be used as a ground cover beneath grapes or blueberries, or managed as a perpetual bed. In late summer, remove weeds and withered leaves, and thin runners to no more than 3 per plant. Lift and transplant extra runners. 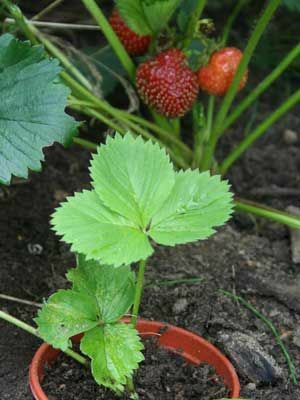 Slugs can be deterred with straw mulch or traps. Use lightweight cloth or netting to protect ripening berries from birds.